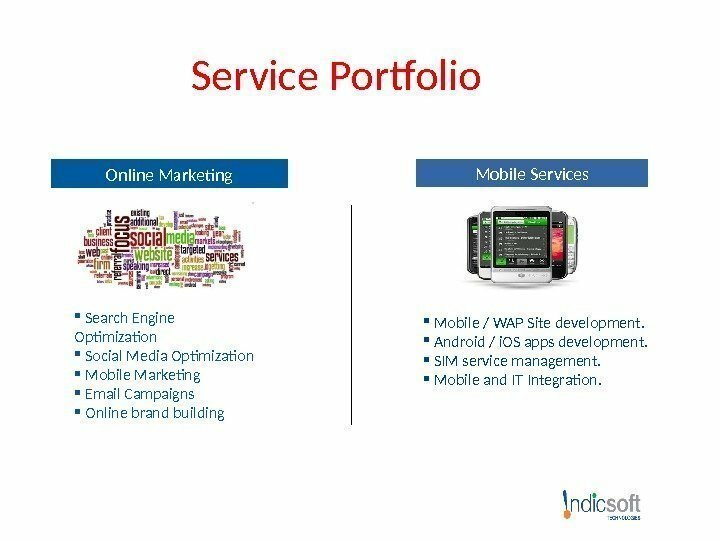 Service Portfolio Online Marketing Search Engine Optimization Social Media Optimization Mobile Marketing Email Campaigns Online brand building Mobile Services Mobile / WAP Site development. 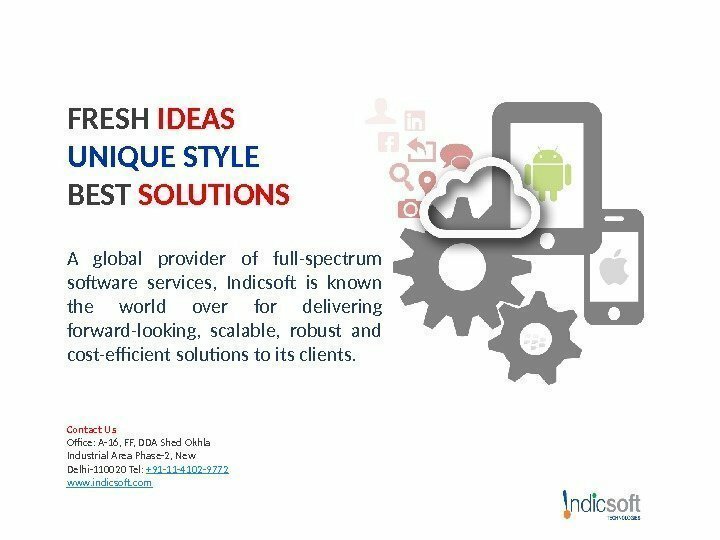 Android / i. OS apps development. 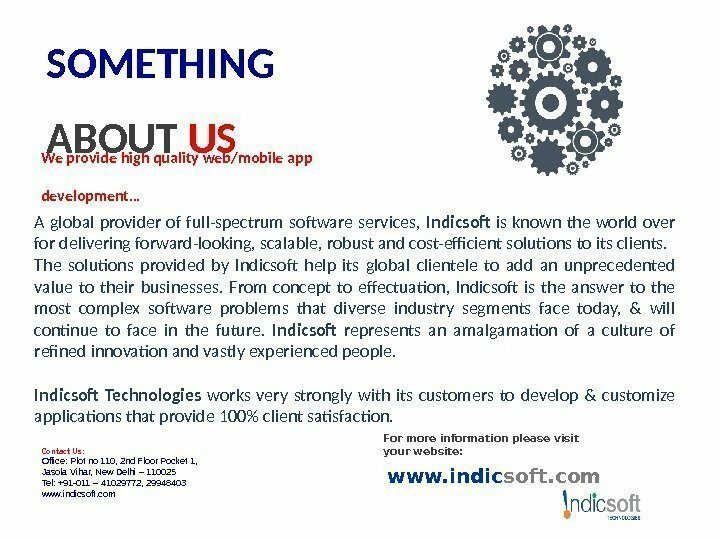 SIM service management. 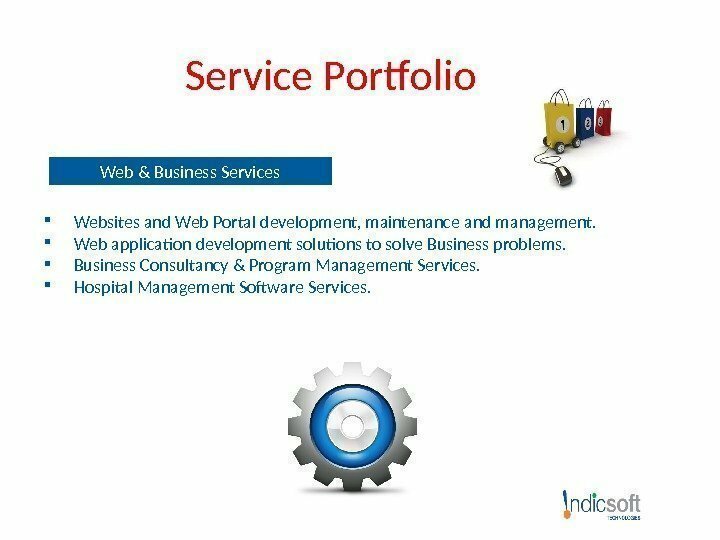 Mobile and IT Integration. .
Service Portfolio Web & Business Services Websites and Web Portal development, maintenance and management. 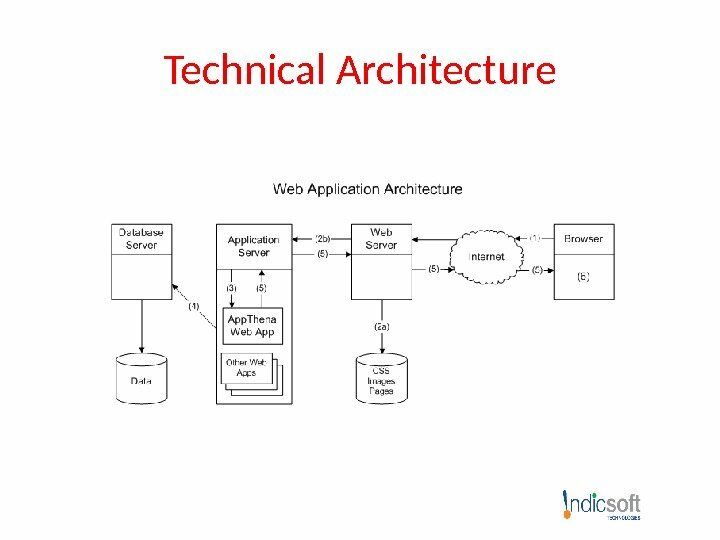 Web application development solutions to solve Business problems. 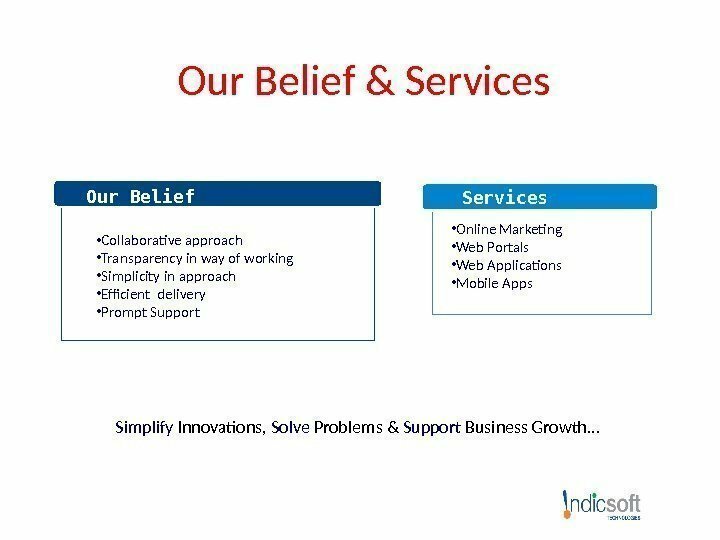 Business Consultancy & Program Management Services. 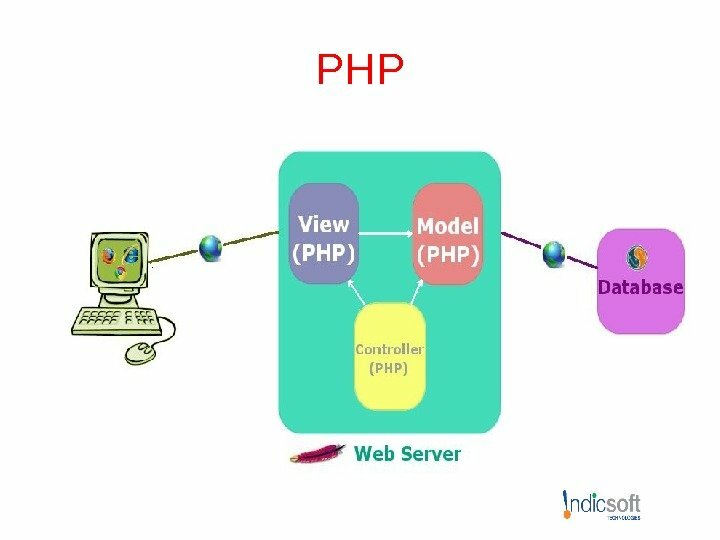 Hospital Management Software Services. .
Introduction E-commerce is the buying and selling of goods and services, or the transmitting of funds or data, over an electronic network, primarily the Internet. 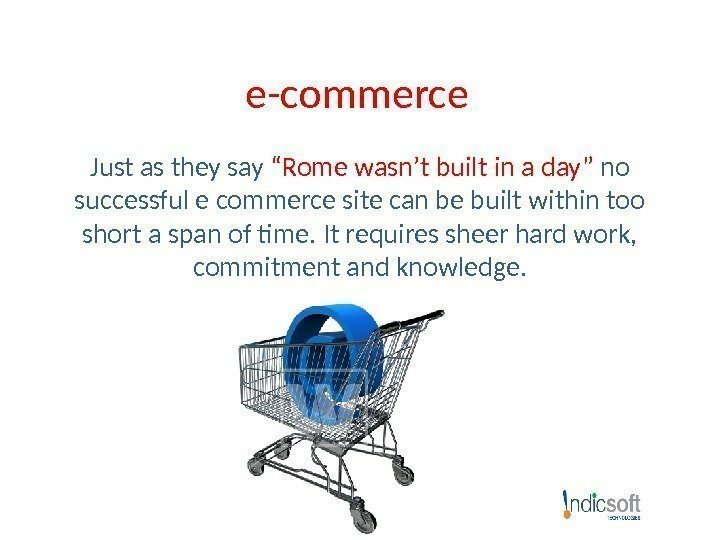 e-commerce Just as they say “Rome wasn’t built in a day” no successful e commerce site can be built within too short a span of time. It requires sheer hard work, commitment and knowledge. 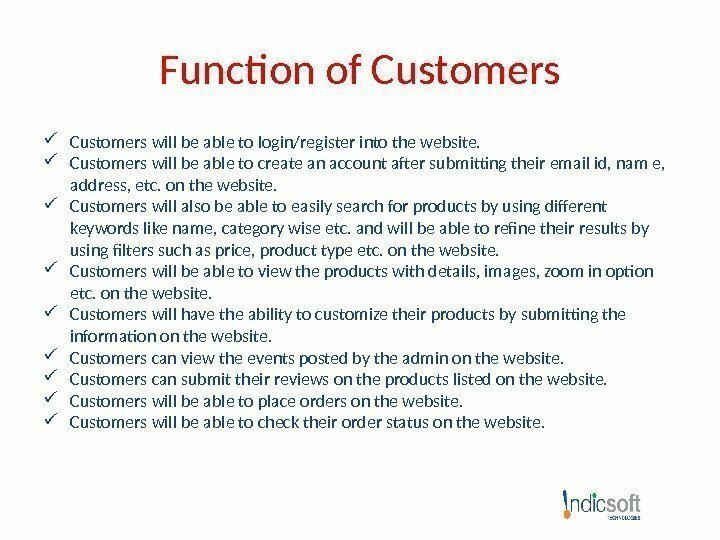 Function of Customers will be able to login/register into the website. 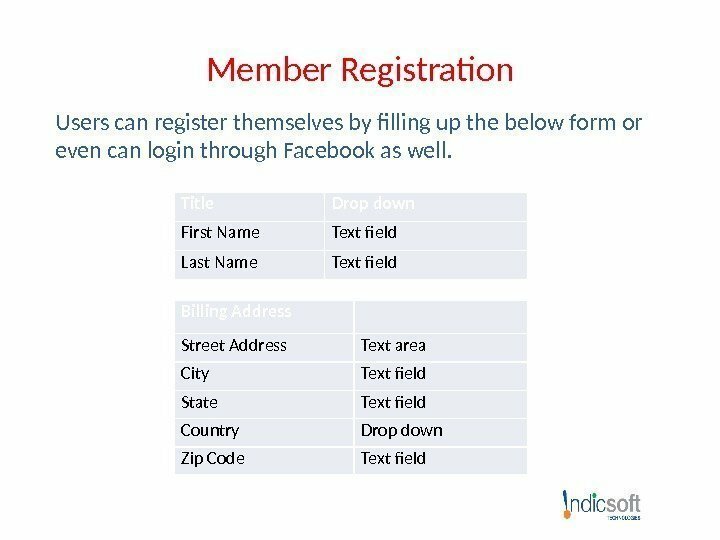 Customers will be able to create an account after submitting their email id, nam e, address, etc. on the website. 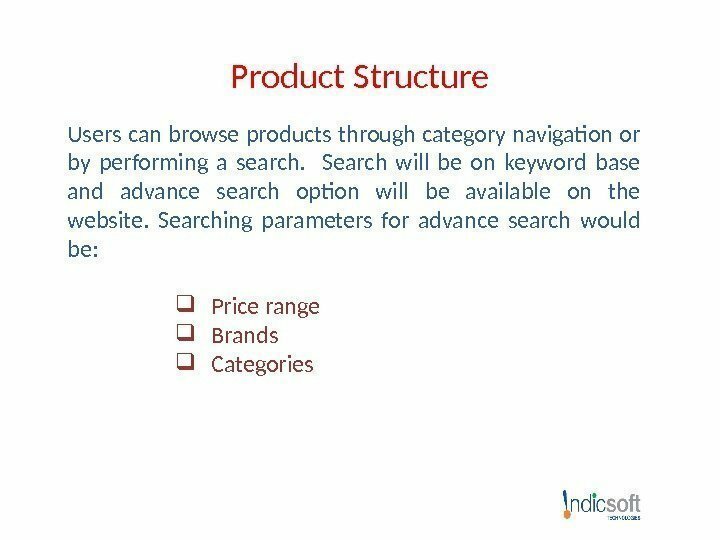 Customers will also be able to easily search for products by using different keywords like name, category wise etc. and will be able to refine their results by using filters such as price, product type etc. on the website. 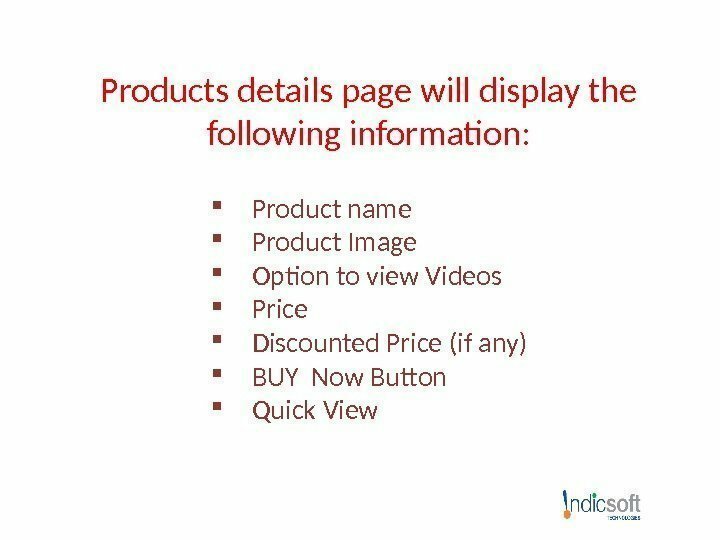 Customers will be able to view the products with details, images, zoom in option etc. on the website. 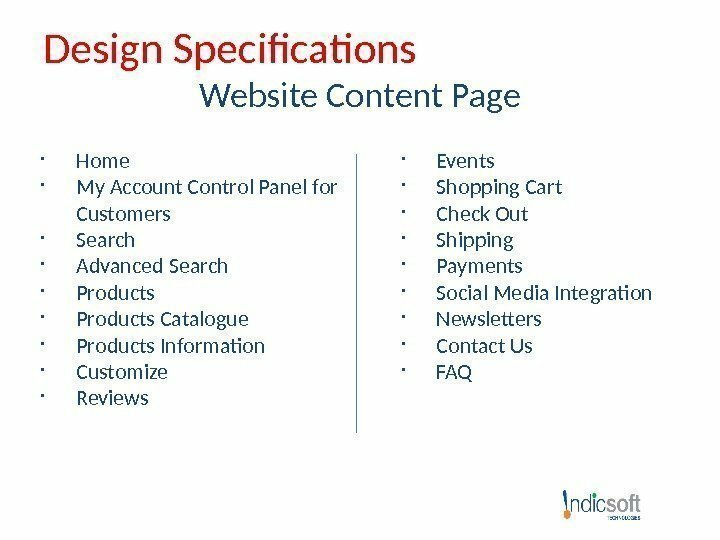 Customers will have the ability to customize their products by submitting the information on the website. Customers can view the events posted by the admin on the website. Customers can submit their reviews on the products listed on the website. Customers will be able to place orders on the website. 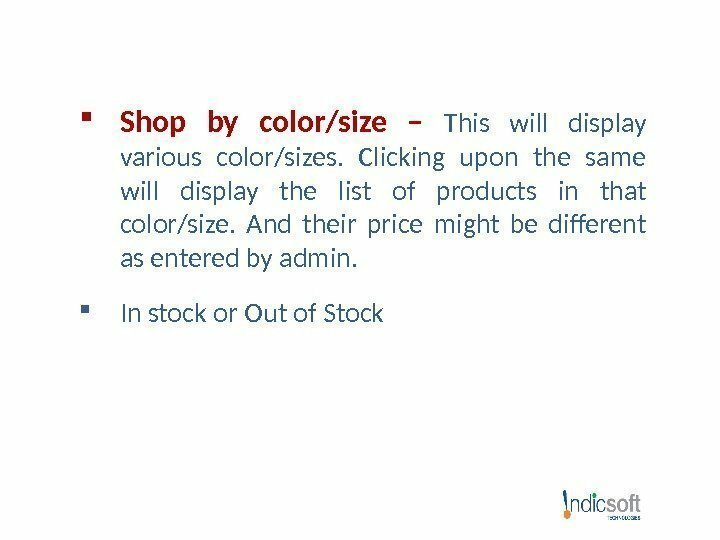 Customers will be able to check their order status on the website. 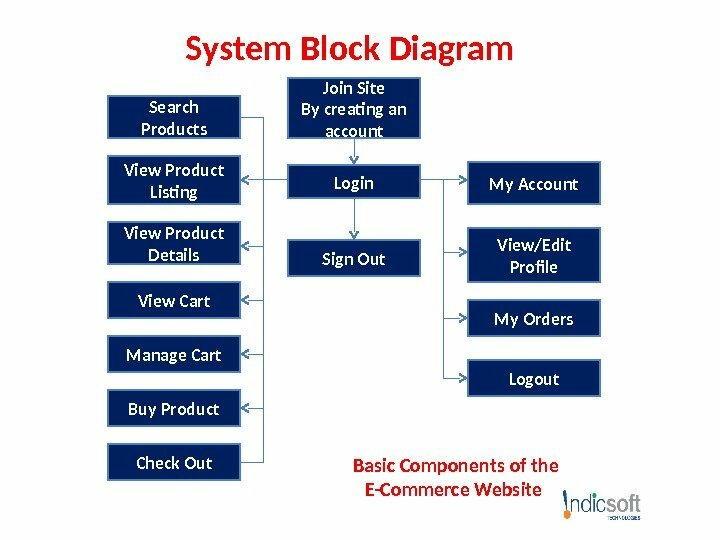 Function of Customers will be able to use the facility of shopping cart on the website. 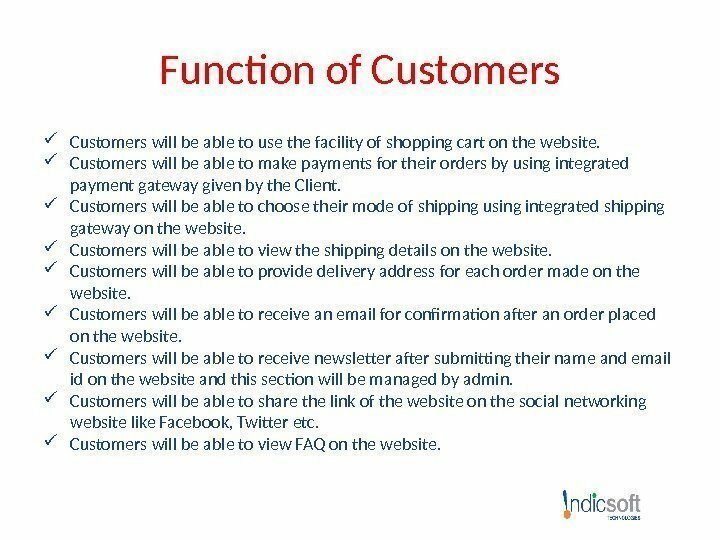 Customers will be able to make payments for their orders by using integrated payment gateway given by the Client. 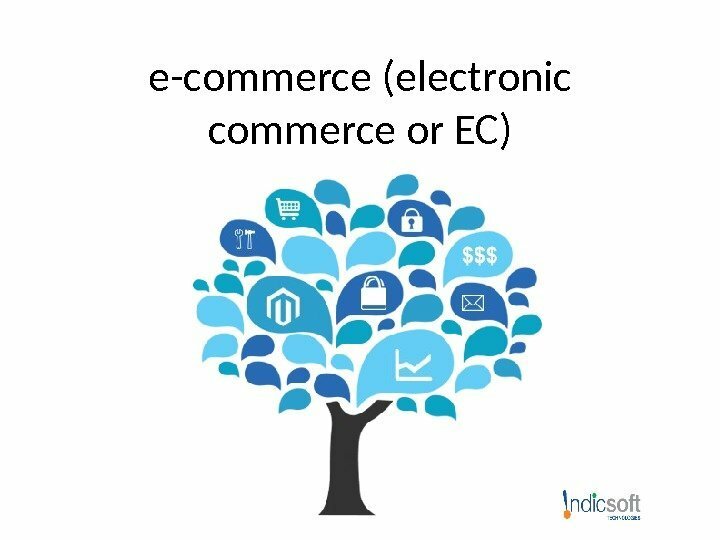 Customers will be able to choose their mode of shipping using integrated shipping gateway on the website. Customers will be able to view the shipping details on the website. Customers will be able to provide delivery address for each order made on the website. Customers will be able to receive an email for confirmation after an order placed on the website. 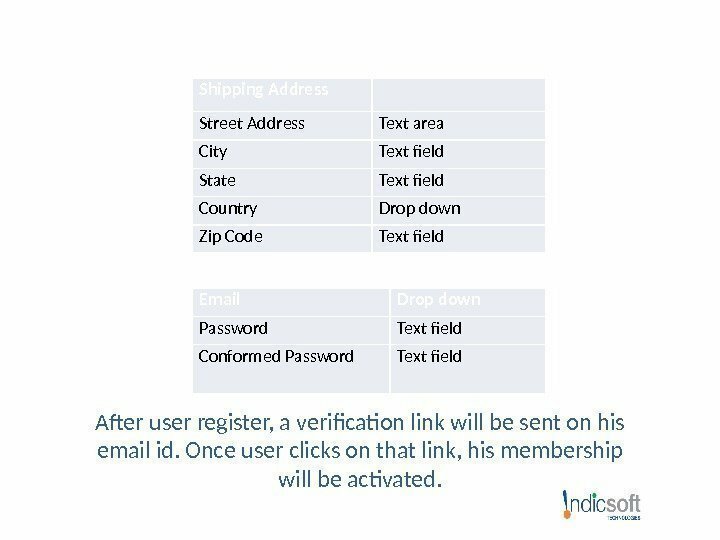 Customers will be able to receive newsletter after submitting their name and email id on the website and this section will be managed by admin. Customers will be able to share the link of the website on the social networking website like Facebook, Twitter etc. Customers will be able to view FAQ on the website. Clicking on main category will display the list of subcategories. 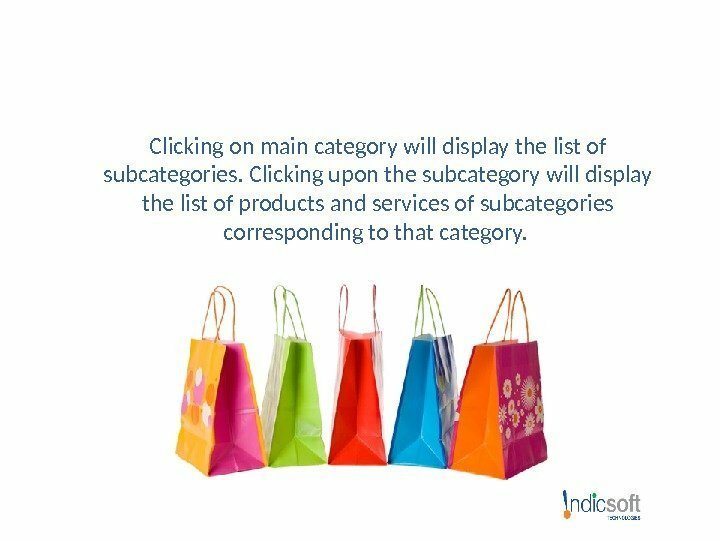 Clicking upon the subcategory will display the list of products and services of subcategories corresponding to that category. 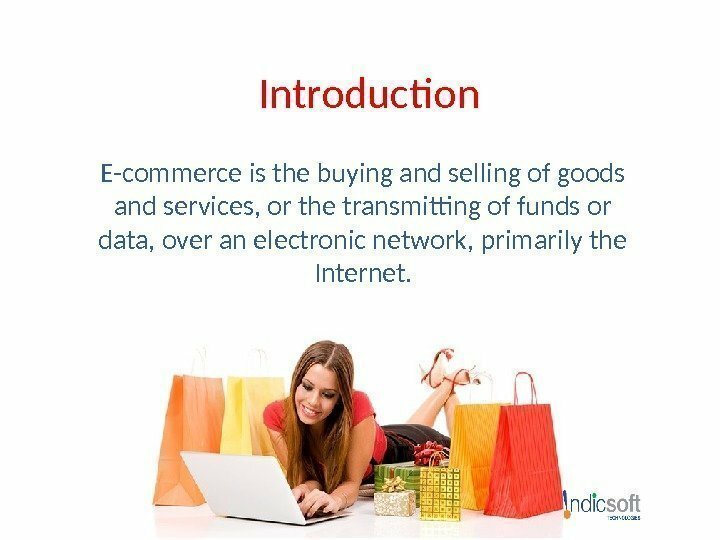 Shopping Cart Users add products of their interest to shopping cart before actually purchasing them. Once they are done, they can checkout to place their order. 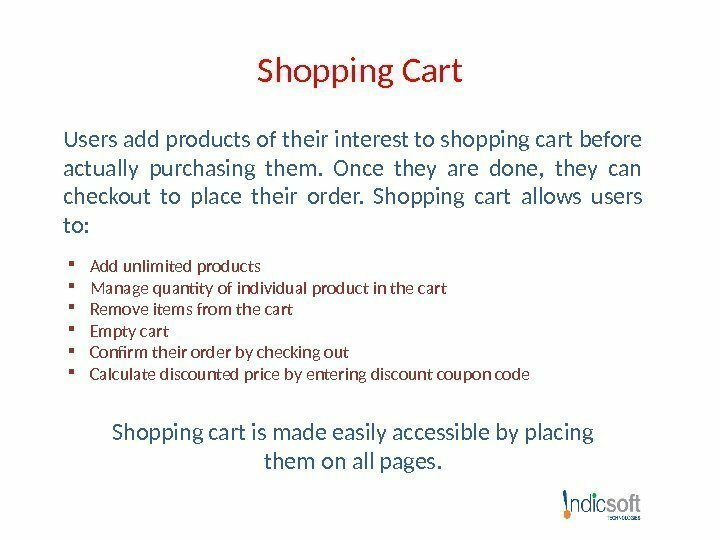 Shopping cart allows users to: Add unlimited products Manage quantity of individual product in the cart Remove items from the cart Empty cart Confirm their order by checking out Calculate discounted price by entering discount coupon code Shopping cart is made easily accessible by placing them on all pages. 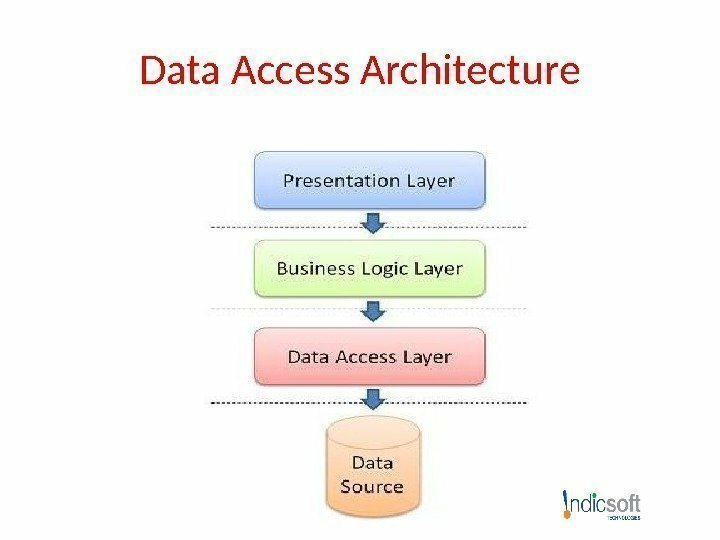 Shipping Address Street Address Text area City Text field State Text field Country Drop down Zip Code Text field Email Drop down Password Text field Conformed Password Text field After user register, a verification link will be sent on his email id. Once user clicks on that link, his membership will be activated. 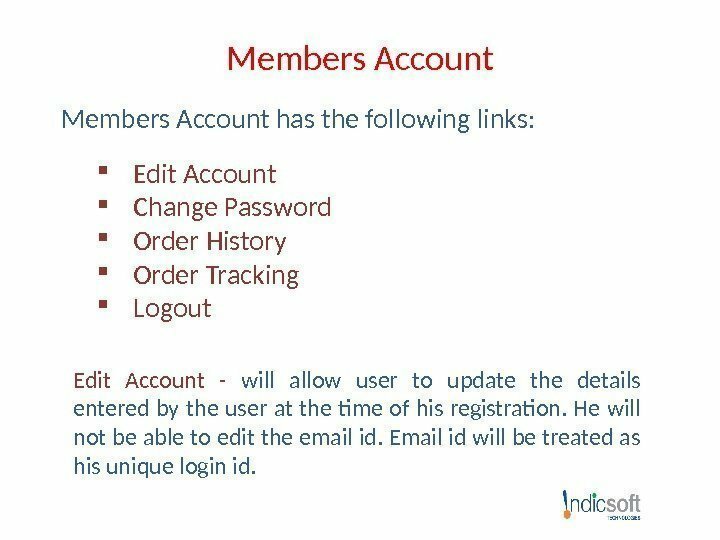 Members Account has the following links: Edit Account Change Password Order History Order Tracking Logout Edit Account — will allow user to update the details entered by the user at the time of his registration. He will not be able to edit the email id. Email id will be treated as his unique login id. 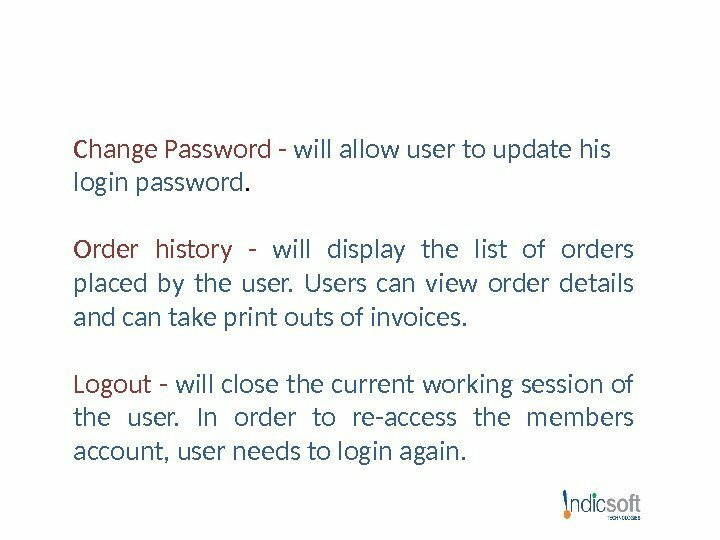 Change Password — will allow user to update his login password. Order history — will display the list of orders placed by the user. Users can view order details and can take print outs of invoices. Logout — will close the current working session of the user. In order to re-access the members account, user needs to login again. Order Process Users will checkout from their cart to place their order. Users will be asked to login in order to proceed further. After login, they will be asked to confirm their details. These details include their shipping and billing details. Once confirmed, user will be taken to payment method selection. Be default, COD option will be selected. 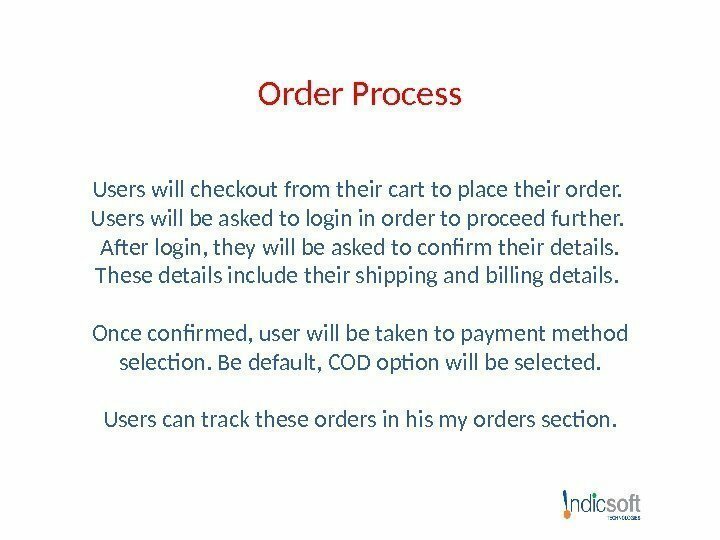 Users can track these orders in his my orders section. 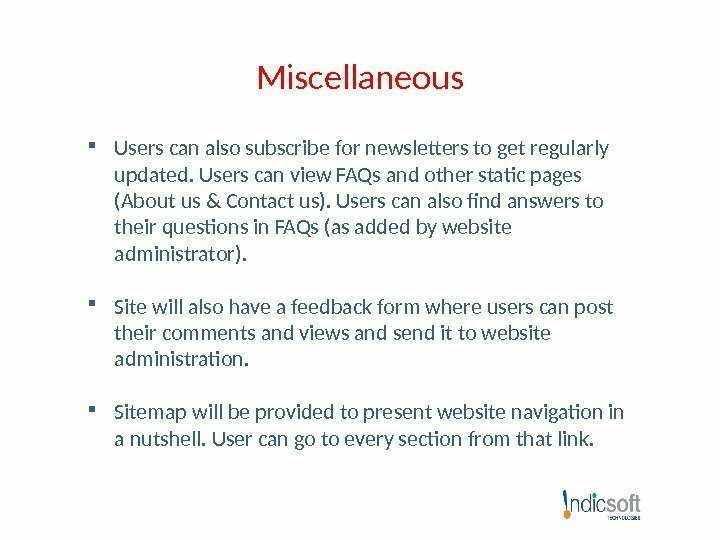 Miscellaneous Users can also subscribe for newsletters to get regularly updated. Users can view FAQs and other static pages (About us & Contact us). Users can also find answers to their questions in FAQs (as added by website administrator). Site will also have a feedback form where users can post their comments and views and send it to website administration. 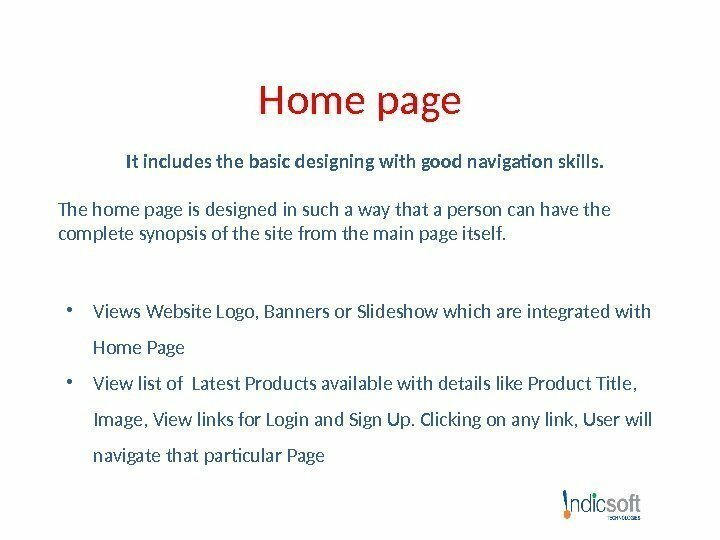 Sitemap will be provided to present website navigation in a nutshell. User can go to every section from that link. NEWSLETTE R • Users can also subscribe for newsletters to get regularly updated. 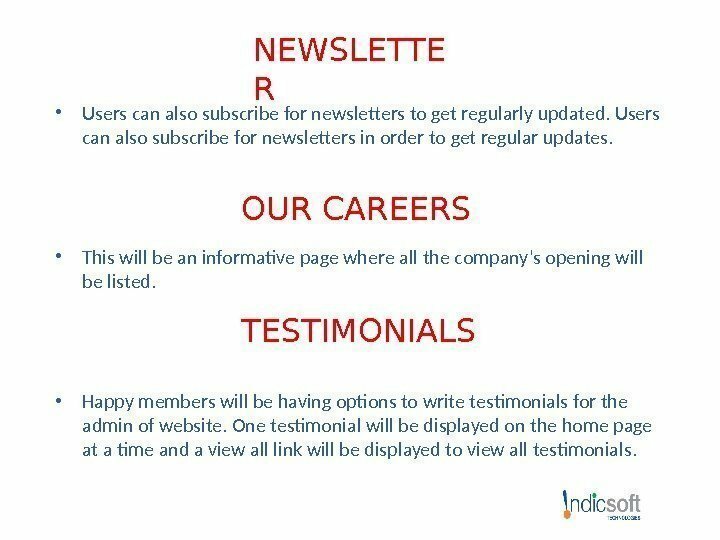 Users can also subscribe for newsletters in order to get regular updates. OUR CAREERS • This will be an informative page where all the company’s opening will be listed. TESTIMONIALS • Happy members will be having options to write testimonials for the admin of website. One testimonial will be displayed on the home page at a time and a view all link will be displayed to view all testimonials. Manage Products • This section will allow admin to manage products and categories on the website. 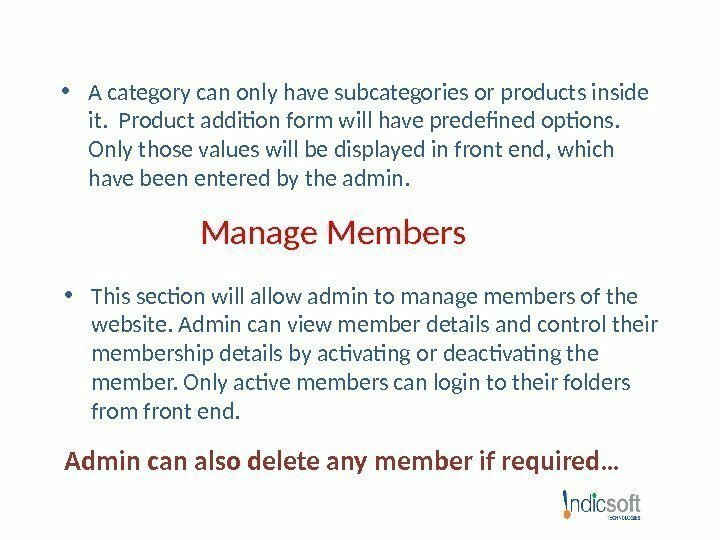 Admin can add categories, subcategories and products. 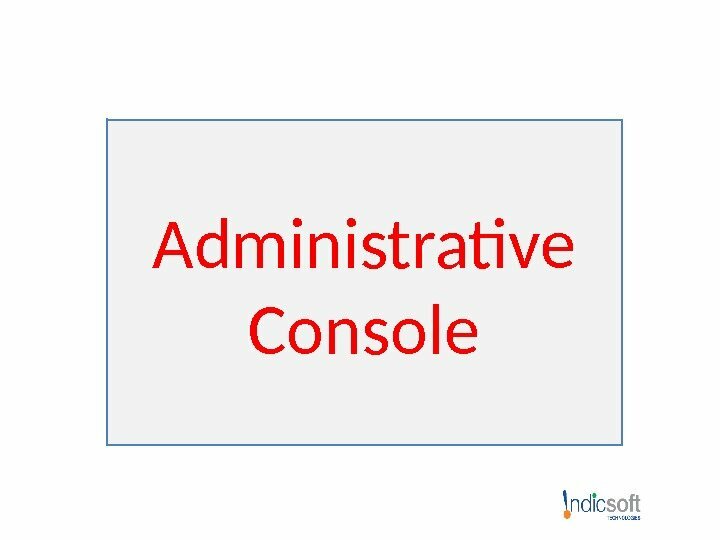 Admin can manage them by adding, updating, control display status (active/Inactive) and deleting them. 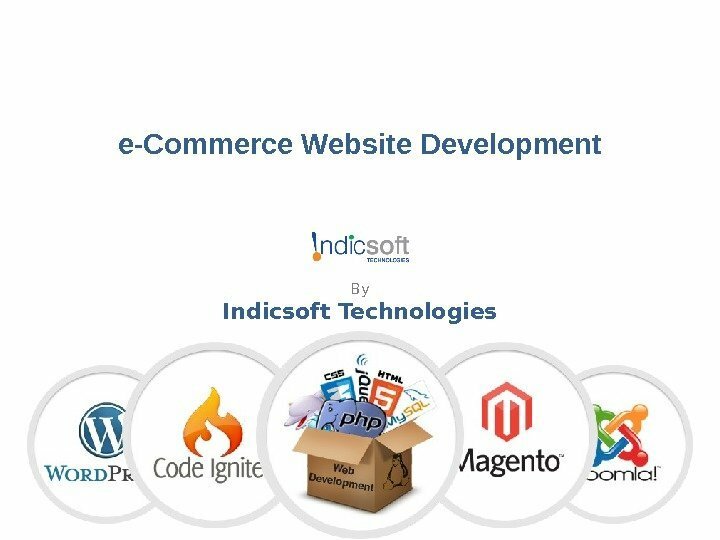 The product can be set as new Arrivals and it will display in section of new arrivals in front-end. 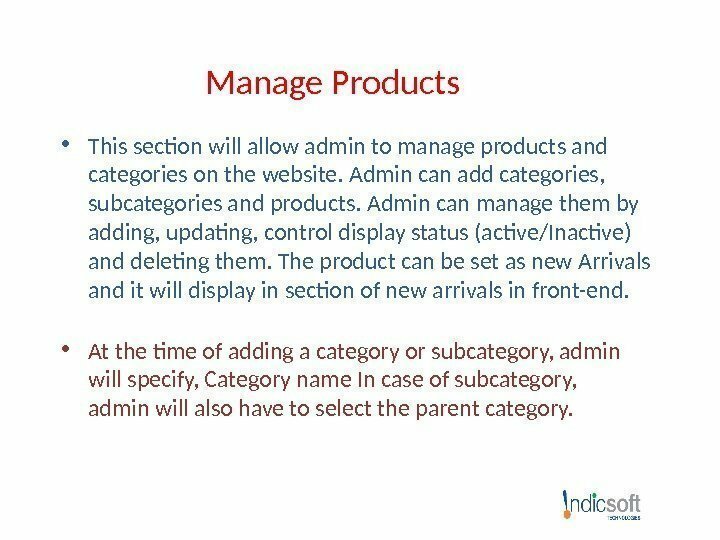 • At the time of adding a category or subcategory, admin will specify, Category name In case of subcategory, admin will also have to select the parent category. 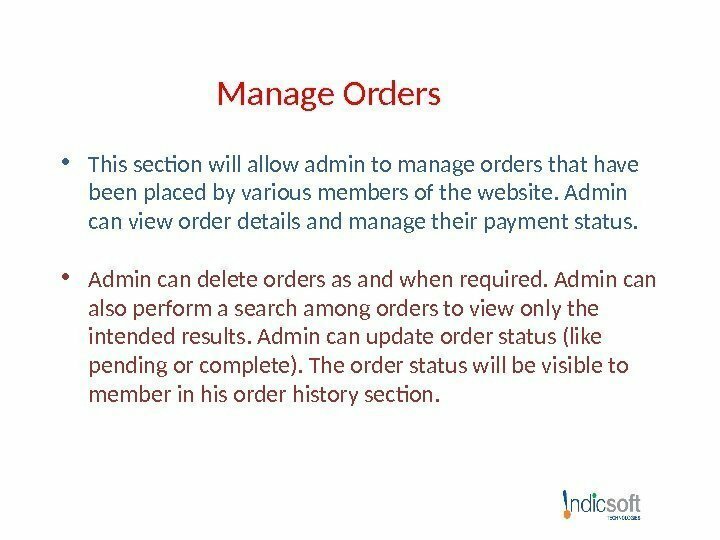 Manage Orders • This section will allow admin to manage orders that have been placed by various members of the website. Admin can view order details and manage their payment status. • Admin can delete orders as and when required. Admin can also perform a search among orders to view only the intended results. Admin can update order status (like pending or complete). The order status will be visible to member in his order history section. Manage FAQs Admin can add and manage FAQs. 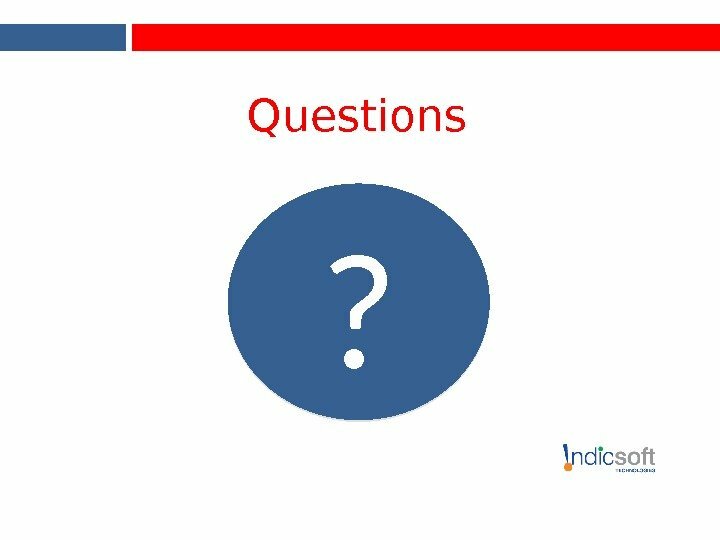 Admin will specify the question and its answer at the time of adding or updating the FAQ. Admin can control the display status by activating or deactivating the FAQ. 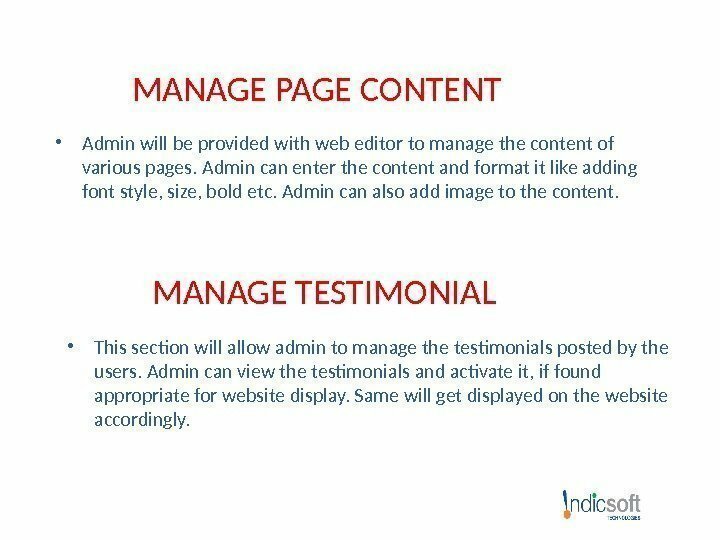 Manage Page Content Admin will be provided with web editor to manage the content of about us and Contact us page. 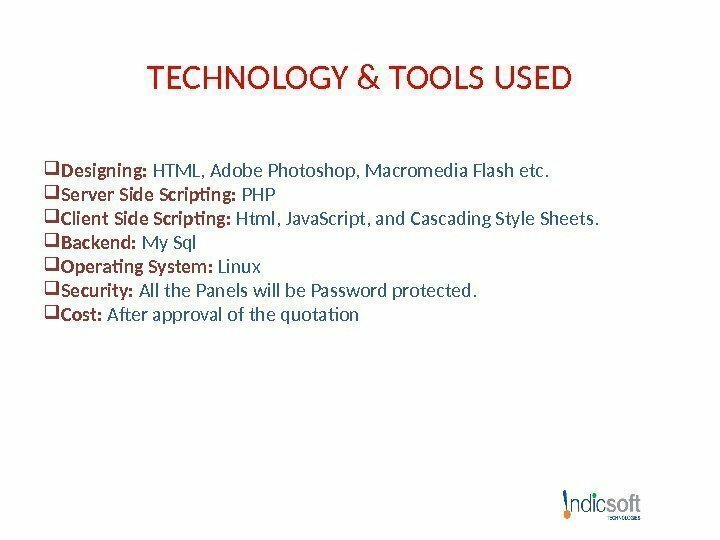 Admin can enter the content and format it like adding font style, size, bold etc. Admin can also add image to the content. NEWS AND EVENTS • This section will display latest announcements, updates or news. The news going to be display here, will be added the admin with the help of the control panel provide to him. 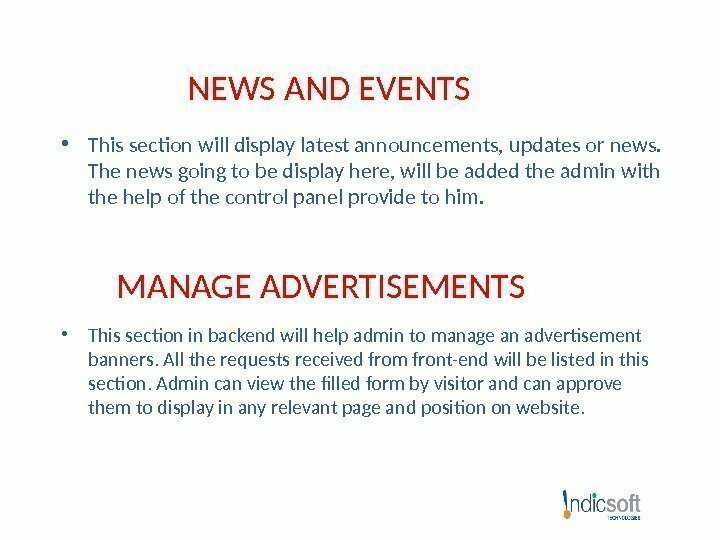 MANAGE ADVERTISEMENTS • This section in backend will help admin to manage an advertisement banners. 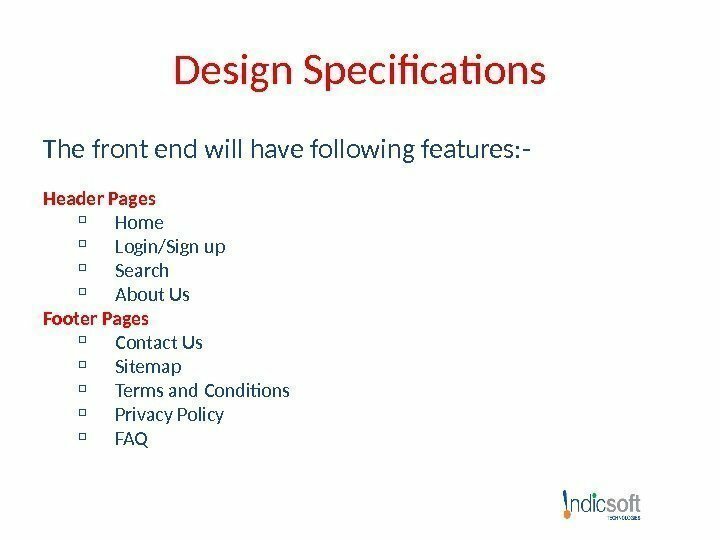 All the requests received from front-end will be listed in this section. Admin can view the filled form by visitor and can approve them to display in any relevant page and position on website. 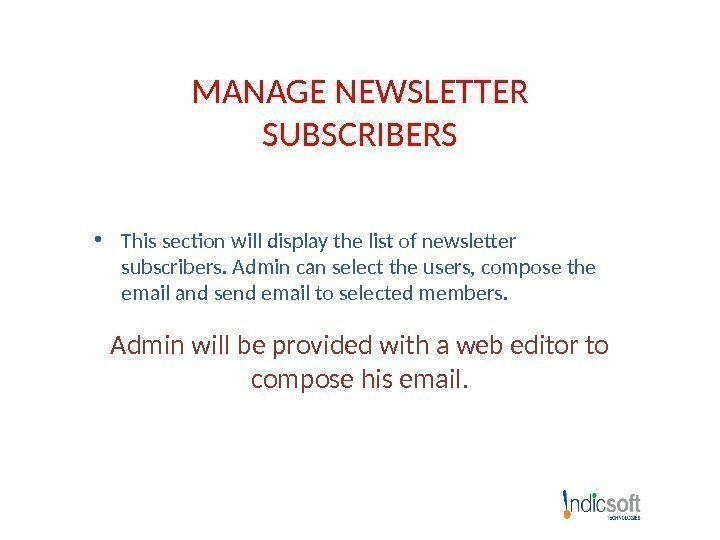 MANAGE NEWSLETTER SUBSCRIBERS • This section will display the list of newsletter subscribers. Admin can select the users, compose the email and send email to selected members. 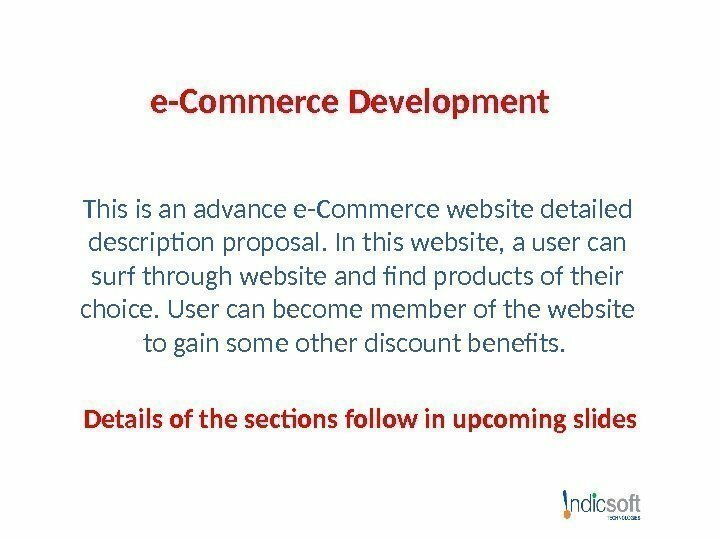 Admin will be provided with a web editor to compose his email. 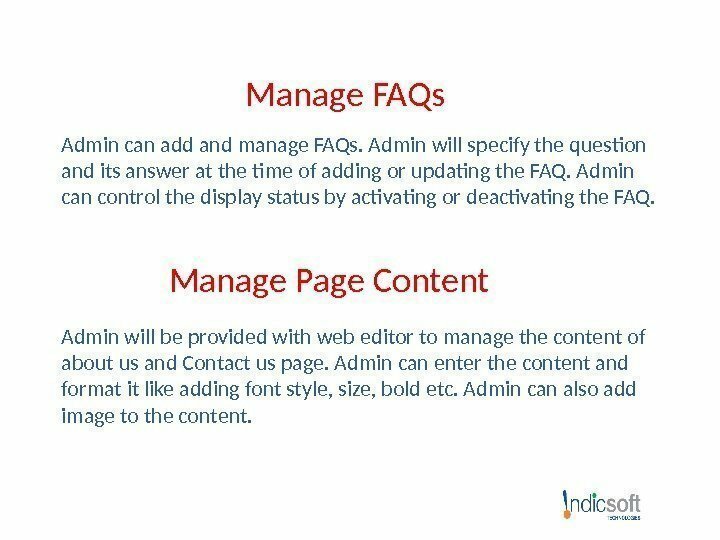 MANAGE PAGE CONTENT • Admin will be provided with web editor to manage the content of various pages. Admin can enter the content and format it like adding font style, size, bold etc. Admin can also add image to the content. MANAGE TESTIMONIAL • This section will allow admin to manage the testimonials posted by the users. 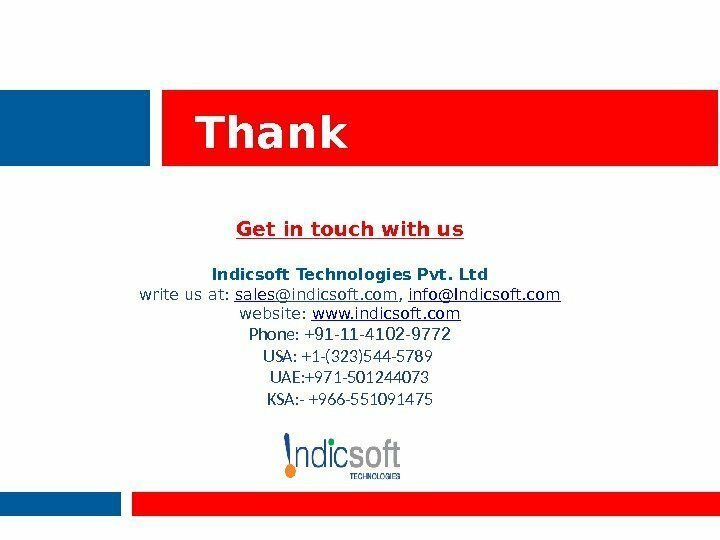 Admin can view the testimonials and activate it, if found appropriate for website display. Same will get displayed on the website accordingly. 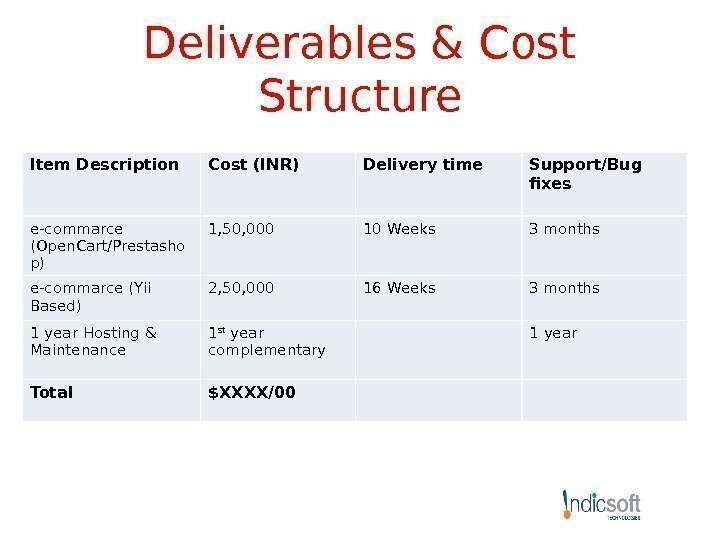 Please note that the above mentioned are initial project modules. 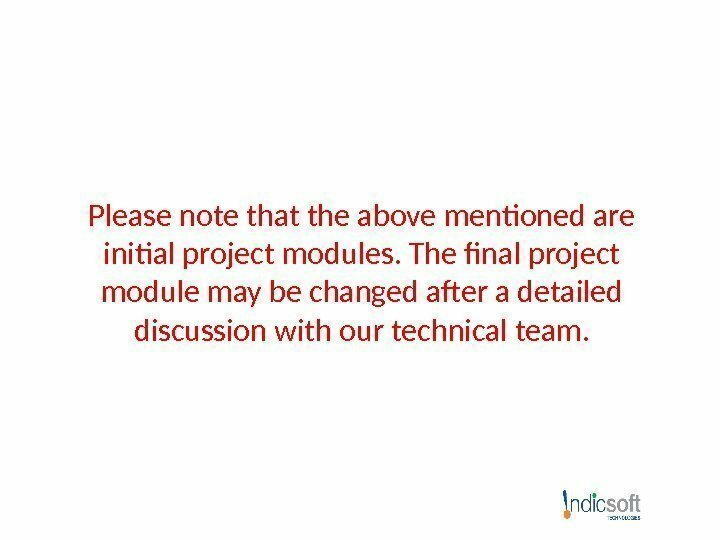 The final project module may be changed after a detailed discussion with our technical team.